Congratulations to Sydney DePompei, as she has been selected as Athlete of the Week! 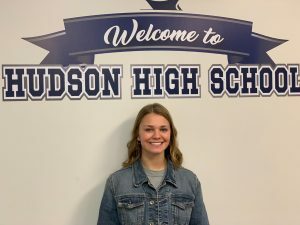 Sydney, a junior gymnast, helped the Explorers turn in their highest score of the season at the Suburban League Championships over the weekend. She took home 1st overall on the balance beam, earning 1st team All-League honors on beam! She also took home 4th overall on the floor exercise, earning 2nd team All-League honors on floor. Those two strong finishes helped her place 5th overall in the all-around competition. Sydney feels floor is her strongest event, but enjoys competing on beam the most. She has been participating in gymnastics for 13 years and loves the team aspect that comes with being a member of the high school team. Following graduation, Sydney hopes to attend Bowling Green State University or Kent State University, while majoring in athletic training and possibly continuing her gymnastics career. She also plays softball and runs track.